The Southampton Harbour Hotel & Spa sits in Southampton’s Ocean Village. The decks and glass of the hotel echo the cruise ships which set sail from this port, while the waterside setting offers sea views at every turn. 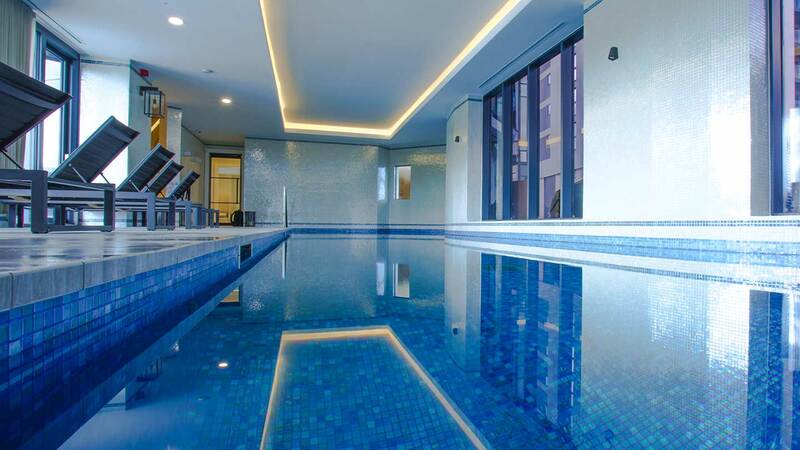 The petite spa offers a gleaming mosaic tiled pool, a hydro pool, sauna and steam room. Make the most of the views by relaxing on the terrace before a treatment by ESPA. 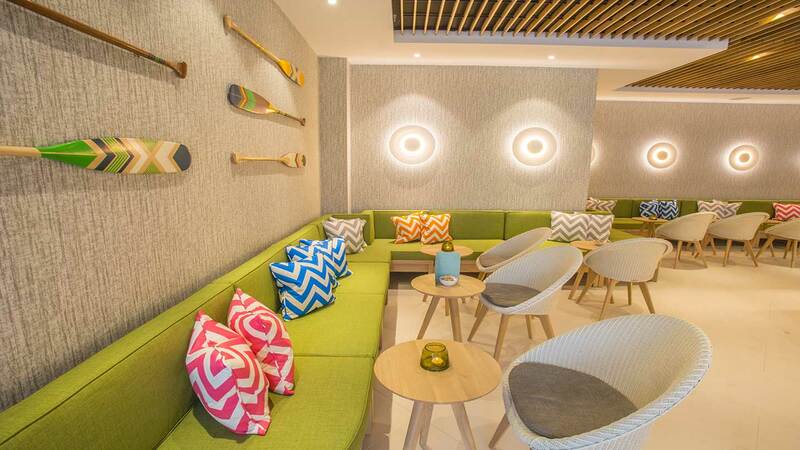 The Southampton Harbour Hotel is a swish, contemporary addition to the Ocean Village marina. The decks and glass of the hotel echo the cruise ships which set sail from this port, while the waterside setting offers sea views at every turn. The HarSPA makes the most of the marine environment, too, from the blue mosaics of the pool to the terrace where you can relax overlooking the water. The changing rooms are upstairs. Banks of wooden lockers with keys sit over benches for changing on. The five showers have ESPA shampoo, body wash and conditioner (bliss.) You also have hand lotion, hairdryers and straighteners to hand, alongside shower caps and cotton-wool. There are two private changing spaces and two loos, all of which were clean and sparkling on our visit. You can help yourself to a white towelling robe and slippers, and fresh towels at any time from the stock just outside the changing room door. Head back downstairs again to the beautifully gleaming, mosaic-tiled 15-metre swimming pool, with five rattan loungers to relax on alongside. Further loungers adorn a terrace overlooking the water, which must be idyllic on sunny days. The pool has a mix of hotel guests and local health club members throughout the day so is a sociable, shared space rather than a temple of calm. The children's swimming times are from 8.30 to 10.30am, then again from 5 to 6pm; this allows for adult-only relaxation if you're here for a spa day. A toasty, tiled hydro-pool bubbles away, allowing five close friends to sit together. The wooden-benched sauna, which could seat several people, and the steam room, which would comfortably accommodate around five, were both nicely hot on our visit. Cool down between your toastiness in the experience showers. 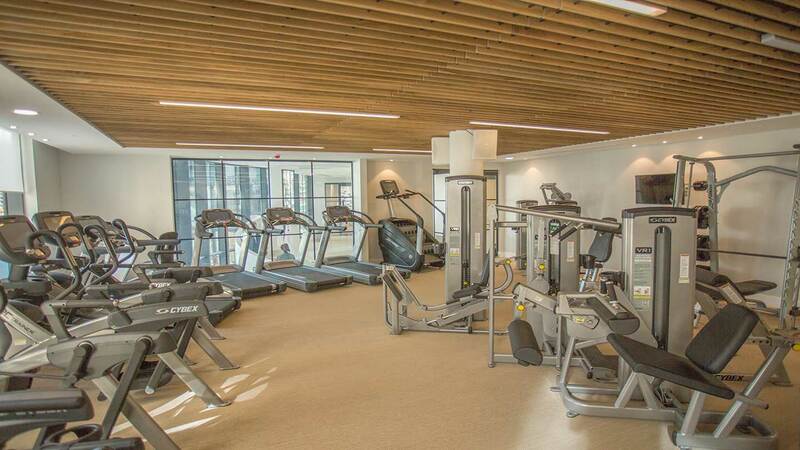 The air-conditioned gym, which you can use on your spa day, has a good range of equipment. Jugs of iced water outside the gym doors allow you to stay hydrated. 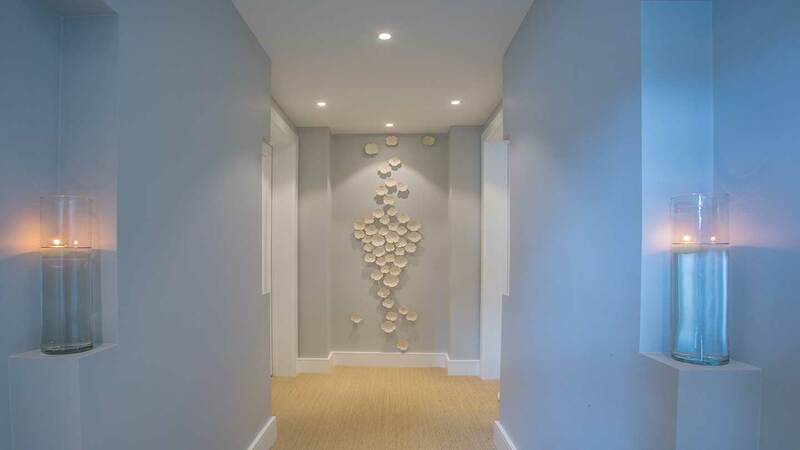 The seven neutrally-toned treatment rooms are tucked away down a separate corridor to keep them as quiet as possible. The relaxation room has several loungers to kick back on, as well as tea and magazines to read. 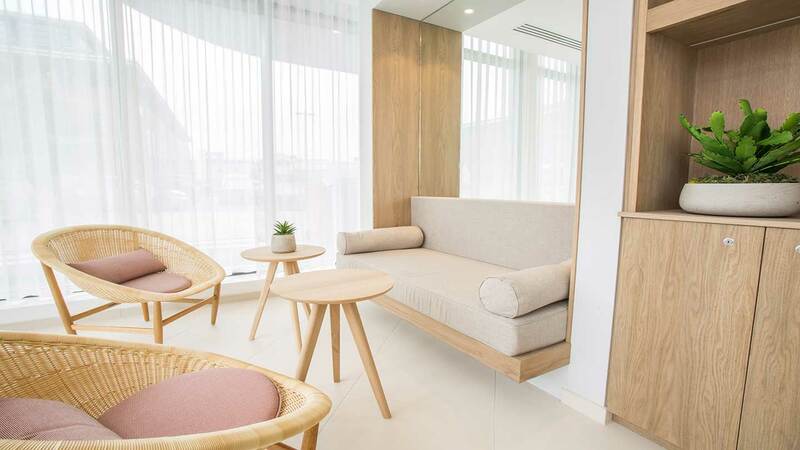 It is not a dedicated post-treatment relaxation room, however, so expect some conversation to disturb your slumbers. We tried the Invigorating Back Pamper (55 minutes, £65) which uses HarSPA's own range of products. My therapist, Robyn, met me in the waiting area, took me through to our treatment room, and went through my consultation form. I lay face down on the wide and heated bed. Robyn started the treatment with a rather invigorating lime and lemongrass scrub: a mixture of salt and oil to exfoliate and smooth my back. Once Robyn removed the scrub with warm mitts, she got straight into a thorough back massage. She paid special attention to my rock-hard shoulders and terminally tense neck. Once she had finished chasing down and banishing the knots in my muscles, it was time for a detoxifying back mask. Robyn painted on the smooth, kaolin-containing clay then treated me to a truly terrific hand and scalp massage. She finished the treatment with an application of fig and vanilla moisturiser. I walked out feeling a lot more relaxed and unwound than when I walked in, and had my lime and lemongrass scrub to take home, too. We also popped into the rasul or mud room -- again, meticulously tiled. This is a timed treatment without a therapist in which you exfoliate your skin, then smear yourself with muds for your body and hair, allow yourself to bake in a swathe of steam then rinse off in a cleansing shower. I left with no bit of me unsmoothed. 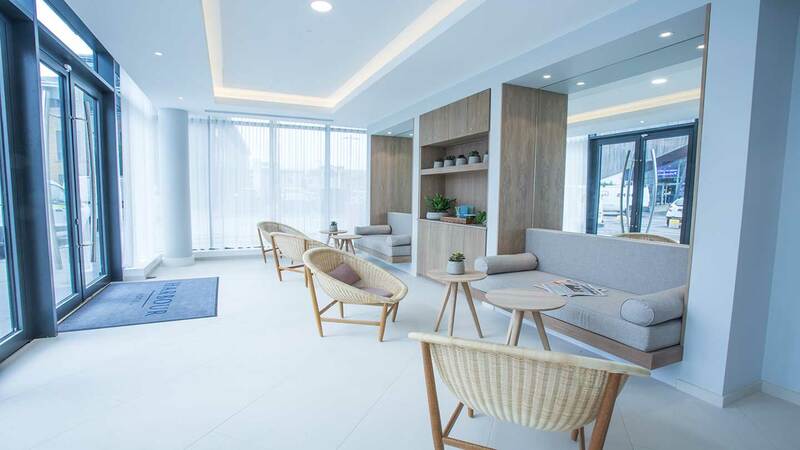 At HarSPA, you can choose from a range of treatments using the HarSPA products including facials, scrubs, wraps, and a variety of massages, plus ESPA body treatments. The spa menu also offers treatments specifically for men and for mums-to-be. You can book in for manicures and pedicures, as well, plus other beauty finishing touches such as waxing and eye treatments. The spa also offers a range of spa days, all of which include complimentary fitness classes, and some also include lunch. If you're visiting the HarSPA for a spa day, you can eat your lunch in your robe in the juice bar and café. There are dressed people in there, too, but we saw many people (including us) comfortable in their robes. The lunch menu includes a choice of one of three proteins -- on our visit, chicken, salmon or vegetarian frittata -- accompanied by a choice of salads. We loved the noodles and the wild rice, plus the seeds and oils to sprinkle on top. If you're staying overnight, don't miss a visit to the rooftop HarBAR on the sixth floor; here, a spectacular view accompanies delicious food ranging from steaks to pizzas to suckling pig, with some vegetarian options along the way. Sip a mojito (mocktails are also available) and watch the sunset to round off your spa day in style. You could also relax here with an indulgent afternoon tea after a treatment or two. Our treatment: It focused on all the areas of tension we needed it to. 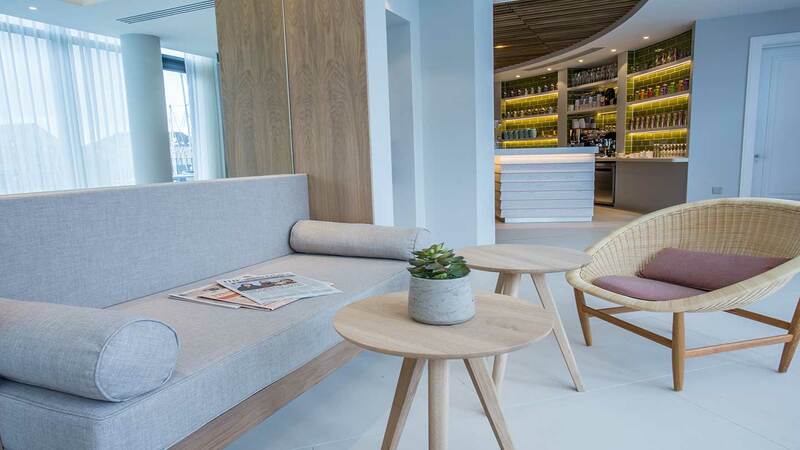 The juice bar: It's a bright social space, ideal for breaking up your spa day with a bit of kale and coconut water (or a glass of Prosecco). Our supremely luxurious bedroom: Why don't more hotels offer enormous marble bathrooms and complimentary decanters of sherry? We nearly moved in. The Capital Radio broadcast in the juice bar; the cheery competitions and news items didn't really add an atmosphere of "spa" for us. This HarSPA is ideal for couples, mothers and daughters, and friends who want to spend some spa time together. The spa is not a hushed place. 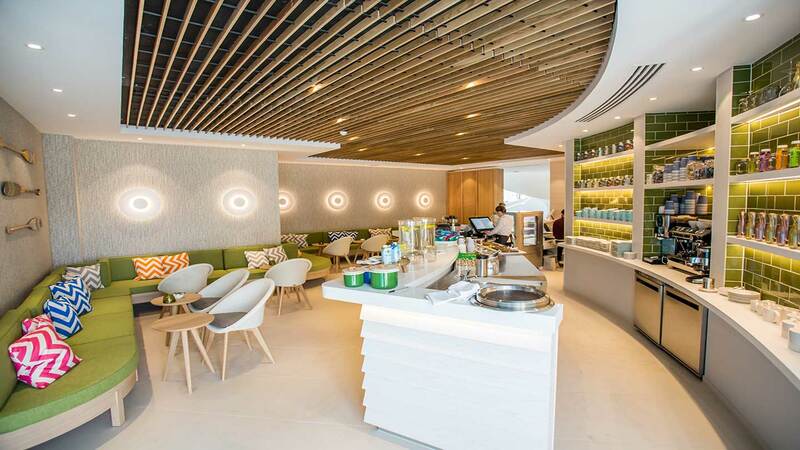 The beautiful mosaic tiles mean that sound bounces off the walls; the hydro-pool bubbles away loudly while people chat; the relaxation room is also a chatty space; even in the juice bar there's -- well, obviously -- the buzz of the juicer. We didn't mind the conviviality but if you're looking for a bit of silent solitude, this HarSPA might not suit you. 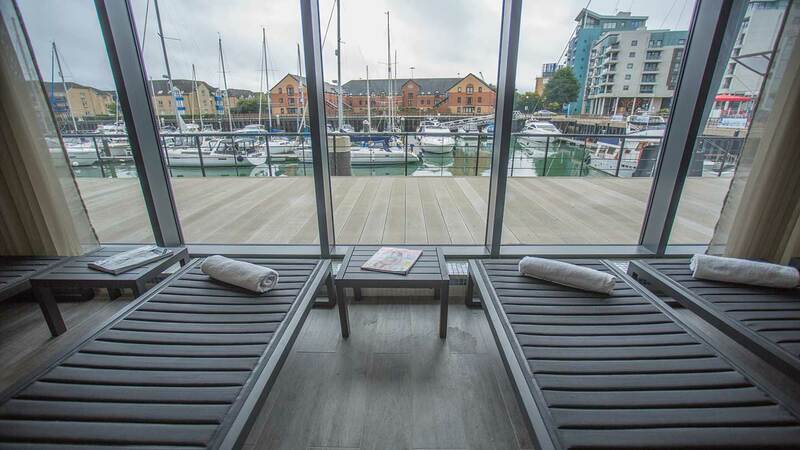 We awarded The HarSPA at Southampton Harbour Hotel a Good Spa Guide Bubble rating of 5 bubbles. The spa is small and the facilities limited but what the spa does, it does well. The customer service was exemplary, the treatments good, and the social, laid-back atmosphere will be appreciated by many of the spa visitors.